I've had this recipe for Simple Lemon Cake saved in my little recipe box for almost a year. I saved it from Everyday Food's Easter issue last year, and I finally made it this weekend. It was a super simple and easy cake recipe, and I loved the citrusy smell of the lemons as they boiled on the stovetop. The clipping I had saved from the magazine varied a bit from this online recipe. Instead of mixing butter, eggs and sugar separately, I added it to the food processor with the lemons. This worked well, and cut out an extra step. 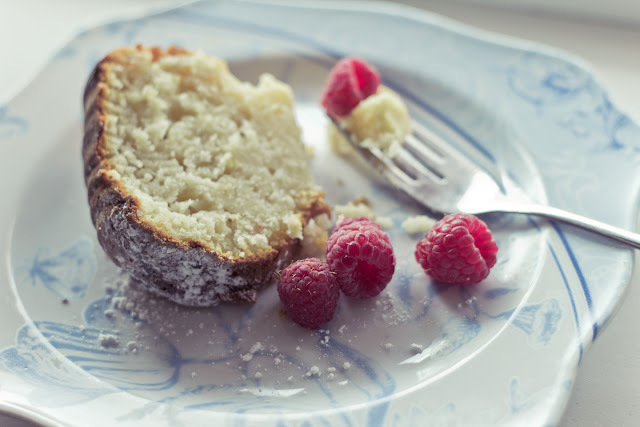 simple lemon cake with raspberries - a springy treat! What a beautiful photo. I'll make you fish tacos, if you make me this cake!